First Gate Rock at Mt. 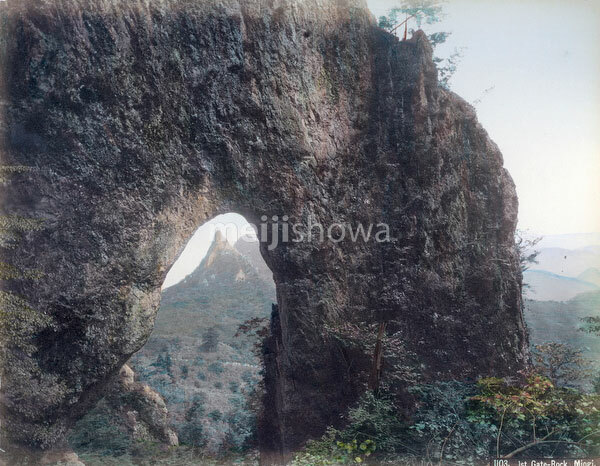 Myogi (妙義山, 1,114 m), in the border of Shimonita-machi, Tomioka City and Annaka City in Gunma Prefecture. The area was along the Nakasendo, one of the two routes that connected Edo (modern-day Tokyo) to Kyoto. Mt. Myogi is one of theThree Great Places of Rugged Beauty in Japan (日本三大奇勝, Nihon Sandai Kisho). The other two are Yabakei Gorge (耶馬溪) in Kyushu and Kankakei Gorge (寒霞渓) in Shikoku.